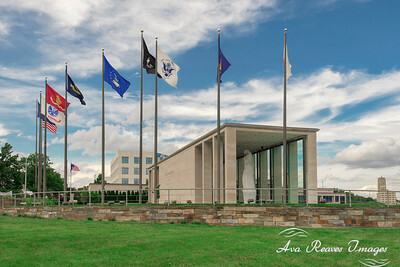 Just outside the south end of the Shrine of Memory fly seven flags: Army, Marines, Navy, Coast Guard, Air Force, Merchant Marines and the Virginia War Memorial. In the center of this semi-circle of flags flies the POW/MIA flag in memory of those Prisoners of War and Missing In Action not yet recovered. To the north fly the national and state flags. Virginia State Capitol is located in Richmond, Virginia. 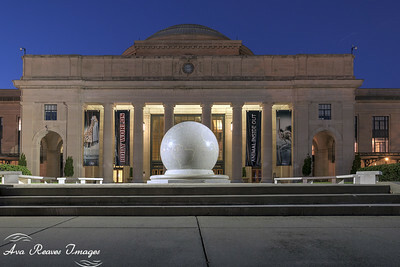 It is the third capital city of the U.S. State of Virginia. 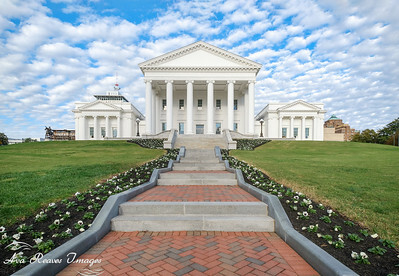 It houses the oldest elected legislative body in North America, the Virginia General Assembly, first established as the House of Burgesses in 1619. 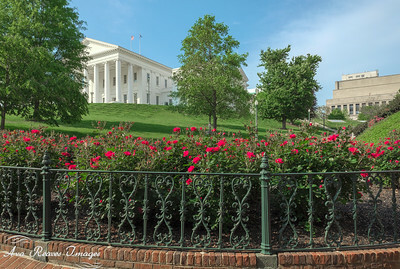 The current Virginia State Capitol grounds are located at 10th and Bank Street. Currently there are three fountains located on the Capitol Grounds. Here is the fountain surrounded by red roses on the southeast side, in front of the Washington Building on the Capitol Grounds. The Maggie L. Walker statue stands at a memorial plaza at Broad and Adams Street in Richmond, Virginia. The statue was dedicated on Maggie L. Walker 153rd birthday. Maggie Lena Walker dedicated her life to civil rights advancement, economic empowerment and education opportunities. She was the first female to become as a bank president. 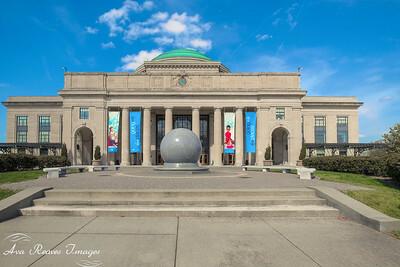 The Science Museum of Virginia was formerly Broad Street Station also known as Union Station. It was built in 1917, and served the Richmond, Fredericksburg and Potomac Railroad, the Norfolk and Western Railroad. It also served Amtrak's Silver Meteor and Silver Star. Passenger service at the Broad Street Station ceased in 1975. 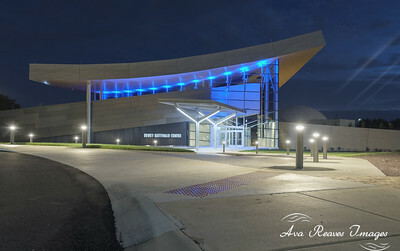 It was added to the National REgister of Historic Places in 1972. Richmond, Virginia received one of the 200 small replicas of the Lady Liberty, from the Robert E. Lee Council of the Boy Scouts of America. This Lady Liberty replica resides in Chimboraz Park. RVA Bike Share program was launched in 2017. It's an easy and fun way to see the City of Richmond. Currently there are 20 bike stations around the city. 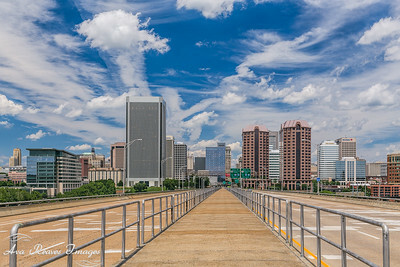 There is a new view of the Richmond, Virginia skyline, since the new T. Tyler Potterfield Memorial foot bridge opened December 2016. 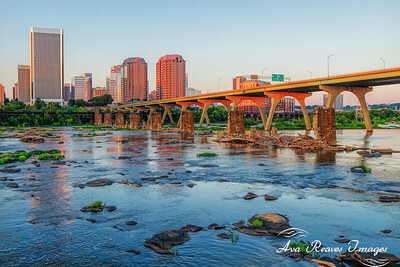 The James River is the largest river in Virginia, and the "Fall of the James" is the 7-mile stretch of the river where it drops more than 100 feet in altitude as it runs through Richmond, Virginia. 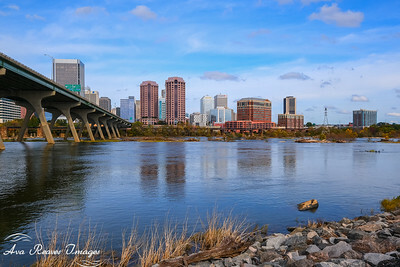 This 7-mile stretch of the James River is near Bosher Dam and the waters around the 14th Street Bridge in downtown Richmond. 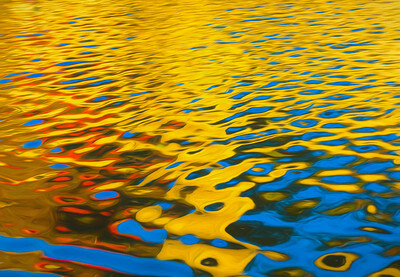 The Richmond Canal Walk stretches for 1 1/4 mile along the Haxall Canal. 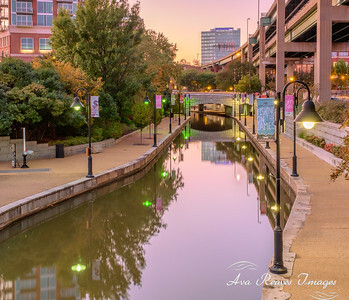 The Canal Walk has centuries of Richmond's history. 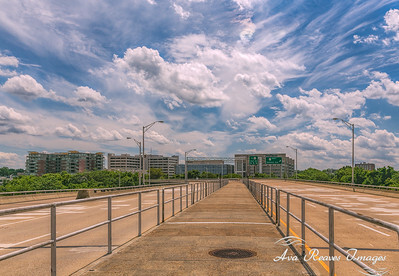 Busy traffic along the downtown expressway in Richmond, Virginia indicates it's the end of the work day. The Richmond skyline surrounds the newly renovated Kanawha Plaza. Kanawha Plaza reopened after a $2.9M renovation. 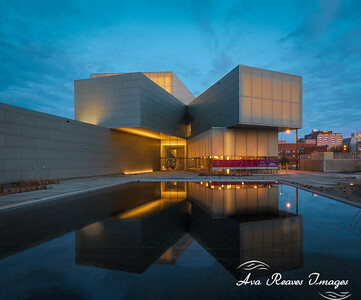 This project restored the crumbling fountain, and added dedicated space for food trucks. The walls that closed in the park are now removed. 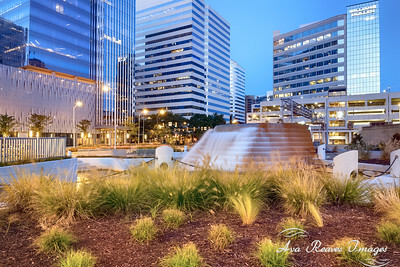 Now completed, Kanawha Plaza is the largest green space in downtown Richmond, Virginia. The CSX A-Line railroad bridge reflects the evening sun on this summer evening.